Mothers are frequently told they must stop breastfeeding if they are sick, either acutely or chronically. In fact, it almost seems as if maternal illness is taken as an opportunity to “give mothers permission to stop breastfeeding” instead of re-assuring them that they can safely continue breastfeeding. Some health professionals, I hope very few, have stated that since “breastfeeding is such a burden on the mother, it is best that if she is ill, not to continue breastfeeding”. If we helped mothers as we should with establishing breastfeeding, breastfeeding would not be a burden, but rather, easy, relaxing, enjoyable. Not only can the mother safely continue breastfeeding, but continuing breastfeeding is good both for the mother and the baby. The issue of maternal medication and breastfeeding has been addressed in another article as has the question of acute illness in the breastfed baby and chronic illness in the breastfed baby. Illness sometimes requires drug treatment and breastfeeding mothers are frequently being told they must stop breastfeeding for the medication they may have to take, usually inappropriately, but sometimes they are told to stop for what can only be called bizarre reasons. For example, a mother who was breastfeeding a 6 month old and had a recent flare-up of her Crohn’s disease was told that the flare-up was due to prolactin and that she would need to stop breastfeeding. I guess prolactin works really slowly because prolactin was being secreted in large quantities during the pregnancy and was important in the making of breastmilk from immediately after birth. It seems that breastfeeding can be blamed for making every illness worse. Sometimes it seems that for some doctors, any reason is good enough to tell mothers to stop breastfeeding. It should be noted that the symptoms of many chronic diseases, especially, it seems, inflammatory diseases improve during pregnancy. So, it may seem to many observers that somehow breastfeeding is responsible for flare-ups or relapses of symptoms. As well, some chronic illnesses get worse during breastfeeding because mothers stop taking their medications, having been told they cannot take them while breastfeeding. See Breastfeeding and Maternal Illness Part 2. Most infectious diseases, whether they are due to a bacterium or a virus, are usually most infectious before the person with the infection has any symptoms of illness and even know they are sick. Thus, the breastfeeding baby is exposed to the bacterium or the virus for days, even weeks in the case of some infections, before the mother feels sick or has fever. It is true that most viruses have what is called a “viremic” stage, when the virus is present in the blood and thus, theoretically, could appear in the milk, but this stage occurs soon after the mother is exposed to the infection and usually lasts only a few hours and again, before the mother knows she is sick. Therefore, stopping breastfeeding at a time when the mother is already obviously sick implies stopping when the baby needs the protection of breastfeeding the most. It is remarkable that so many health professionals do not seem to understand this. Did the mother not have the illness before she consulted the physician? Was the baby not breastfeeding during that time? Everyone seems to know that breastmilk contains antibodies and how they protect the baby. But when it comes down to the crunch, it seems that nobody really believes the antibodies make any difference. But those antibodies do matter, they do protect. There are, normally, antibodies in the milk, even if the mother is not sick. But when a mother is exposed to an infection, new antibodies specifically directed against the infection to which she was exposed, begin to be produced. How does this work? See the photos below from an article I published in Scientific American in 1995 . When a mother is exposed to a bacterium or virus, the bacterium or virus come into contact with special cells in her intestinal wall called M cells. Unlike other cells in the mother’s intestines, these do not try to reject the microbe, but actually, deliberately, if we can say a cell has free will, absorb the bacterium or virus. 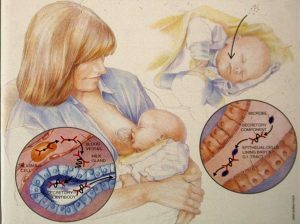 Photo 1: When a breastfeeding mother is exposed to a microbe (virus or bacterium), her body starts making antibodies to the microbe. These antibodies will soon appear in the milk to protect the baby. Photo 2: The infectious agent to which the mother has been exposed has stimulated the production of antibodies to the infectious agent. These antibodies now enter the milk and help to protect the baby. 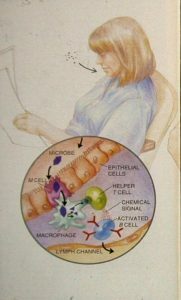 In the intestine (photo 1), information about the microbe (virus or bacterium) passes through a number of cells normally found under the intestinal wall and one, called a B lymphocyte is changed by exposure to that information, enters the lymph and soon, usually within about 24 hours, has now become a plasma cell (lower photo) and is producing antibodies to the very microbe to which the mother has been exposed not that long ago. These antibodies enter the milk and help to protect the baby against the infectious agent to which the mother was exposed. Note that this all is usually occurring before the mother knows she is sick. But note also that it is the exposure to the microbe that sets all this in motion. The mother does not actually have to become ill for all this to happen. In the meantime, breastmilk is providing the baby with many other immune substances (lactoferrin, lysozyme to mention only 2 of many) which help the baby fight off any microbe to which he was exposed. And the antibodies and other substances form a barrier on the mucous membranes of the baby’s body which protect the baby by preventing the microbes from entering his body (the inside of the gastrointestinal tract is considered outside the body). This barrier prevents bacteria and viruses from entering into the baby’s body and is an important way the antibodies and other immune factors protect the baby against infectious agents. If it weren’t so sad, it would be comical to imagine this not rare scenario (a true story, incidentally): A mother develops an upper respiratory infection (a cold). She is seen by the family doctor and is told she cannot breastfeed because 1. The baby will catch the cold from the milk and 2. The mother needs to start on amoxicillin and the baby will get the antibiotic in the milk. The question of why it would have been necessary to see a physician for a cold is another issue which we will leave at this point and the question of antibiotics (also unnecessary for a cold) getting into the milk has been discussed on our website and in a previous chapter. But what about the virus that caused the mother’s cold? To begin with, mothers and babies, especially breastfeeding mothers, are in close contact much of the time, so whoever gave the mother the virus probably also gave it to the baby as well. But even if not, the mother had the virus for a couple of days before she felt ill, so the baby has been receiving immune factors from the breastmilk, including those new antibodies. Furthermore, breastfeeding, the act of breastfeeding, beyond breastmilk, also protects the baby. The very act of breastfeeding decreases stress, decreases cortisol levels in the baby, decreases crying (and thus stress) and the physical contact, skin to skin contact during breastfeeding has been shown to improve the immune response of the baby and lowers the inflammatory response in the baby which is what frequently causes the damage that occurs during infections. Need help with breastfeeding? Make an appointment at the International Breastfeeding Centre.